We are about two months away from when Coachella will announce it’s lineup for the April 14-16 and April. 21-23 dates, so schedules are starting to formalize for many bands. So here’s a stab in the dark as to who make perform at the Empire Polo Grounds. Green Day: All you have to do is look at their tour dates, and it’s very likely the Bay Area punk rockers will be a headliner. Now Green Day will be playing the Forum on Dec. 11, and the spring portion of their U.S. Tour in Phoenix, Las Vegas and San Diego, but no other Southern California dates. On April 30, Green Day will begin the Australian portion of their tour. In 2014, front man Billie Joe Armstrong appeared during the Replacement’s set on Weekend 2 as Westerberg was struggling with his back. Green Day has not played Coachella before. It just seems like a good fit. It would be a natural to bring back the Canadian superstars, who have been dynamic in both their headlining performances. They also have a deep history with Coachella. U2: They’ve been rumored for a couple of years. One year, it appeared U2 might show up, but then Bono got into a bike accident. The legendary band, who seems like a natural with Coachella being so close to the Joshua Tree National Park, has a new album due in 2017 and coming out to the polo grounds will give them exposure to a younger crowd. The wrench to this thought is that if promoters Goldenvoice follows up its successful Desert Trip (aka Oldchella) then U2 might be a better fit for that. Foo Fighters: Well, Dave Grohl’s throne was there in 2016, so maybe he’ll follow-up by actually showing up this time. Grohl’s throne was used by Axl Rose for Guns N Roses’ set at Coachella. The last time Foo Fighters played Coachella was 2002, and Grohl has said it helped rejuvenate the band that had contemplated breaking up. Like U2, they could be asked to play the Oldchella follow-up, so it could prevent their Coachella return. Daft Punk: This has been such a long-standing rumor. Fans want it, and I assume Coachella wants it. What’s the holdup? There was the one Coachella where they had a video of the band between sets that got people to lose their mind that they might make a surprise appearance. And when Arcade Fire headlined in 2014, two people showed up at the start of the set dressed as Daft Punk, but really the audience was punked. Long-time trainer Freddie Roach said he only sees two more fights for his superstar, Manny Pacquiao before the Filipino senator walks away from boxing for good. Pacquiao (58-6-2) returns to the ring for the first time since becoming a senator in May, facing WBO welterweight champion Jessie Vargas (27-1) on Nov. 5 at the Thomas and Mack Center in Las Vegas. In April, Pacquiao defeated Timothy Bradley in what Roach said was his best performance in ages. It was the third time Pacquiao had faced Bradley and the first time he knocked down the Desert Storm, doing it twice to earn a unanimous decision. Although Pacquiao has had a compromised training schedule as he is juggling his busy senatorial duties, Roach said he feels confident going into the Vargas fight. Beyond that fight, Roach doesn’t see the 37-year-old Pacquiao fighting more than one more time if he can secure a big-money fight. The two names Roach said he’d like Pacquiao to take on are Canelo Alvarez and a rematch with the retired Floyd Mayweather. Roach said that scenario is dependent on how Pacquiao looks against Vargas. Win or lose, if Pacquiao looks bad, Roach said he might tell Pacquiao to hang it up. While Roach would like to see Pacquiao, who is a small fighter at the 147-pound welterweight division, take on super welterweight (154 pounds) champion Alvarez, promoter Bob Arum doesn’t like the matchup. Arum said Pacquiao was sparring Ray Beltran, who fights at 135-pounds, and he was the bigger fighter. Alvarez is the current box office king in boxing. While a Pacquiao-Alvarez fight would pit two big names, most fans have been clamoring for Alvarez to face Gennady Golovkin. As far as Arum is concerned, he feels a fight between Pacquiao and super featherweight champion Vasyl Lomachenko. “I would pay any amount of money to see Manny Pacquiao fight Lomachenko,” Arum said. “That for me would be a great, great, great fight. Both Lomachenko and Crawford are promoted by Arum’s Top Rank. One other fighter who has been discussed for Pacquiao is Adrien Broner. Arum said there had been negotiations, but fell apart because of Broner’s demands. “Broner is out of his freakin’ mind,” Arum said. “We offered him a really good purse. We were maybe $100,000 apart. Broner then asked for 50 percent more than the purse we were talking about, which made it outlandish. NOTE: Linda Ha contributed to this report. HOLLYWOOD — Bob Arum has made it clear his distaste for Donald Trump, and he didn’t mince words long-time rival boxing promoter Don King, who has endorsed the GOP presidential candidate. Arum has been a strong support for Democratic candidate Hillary Clinton. As intriguing as having the Raiders play in Las Vegas could be, former coach Tom Flores said it’s not what he really wants to see. But Flores said it looks inevitable that the Raiders will be moving to Sin City unless something dramatic happens. “It’s becoming more and more of a possibility,” Flores said. “I think it’s kind of exciting when you think about it, with all the possibilities there. It would be like a Super Bowl Sunday every home game with all the hotels and the people who come there. Flores was coaching the Raiders the last time they moved out of Oakland. As a result, Flores became the only coach to win a Super Bowl title in Southern California when the Raiders claimed the 1984 title, adding to his 1981 ring while in Oakland. A lot has changed in the NFL, and having a good stadium is paramount. With the revenue sharing, franchise earn its own money through luxury boxes and parking. The Raiders have none of those in the O.co Coliseum. Unless something dramatic happens, it appears the Raiders will leave Oakland again after the 2016 season. There had been talk about the Raiders moving to Levi Stadium, which is the home of the San Francisco 49ers, but Flores said he thinks that’s too far away for the Oakland fans. The Raiders were also discussed to move into the new stadium that’s being built, and has already attracted the Rams from St. Louis. The San Diego Chargers have the option to move to Los Angeles, and if they turn it down, then the Raiders could be the second tenant. As successful as the Raiders were in Los Angeles, Flores said that deal will pale in comparison to going to Las Vegas. “I think every team would like to have its own stadium and control of its own stadium,” Flores said. “I’m sure that’s what the Raiders are looking for in Vegas. But (owner) Mark Davis made it very clear, they would like to stay in Oakland, but they can’t. The league knows it, the rest of the ownership in the NFL, they realize it now. I don’t think there would be much opposition if they do decide to move. 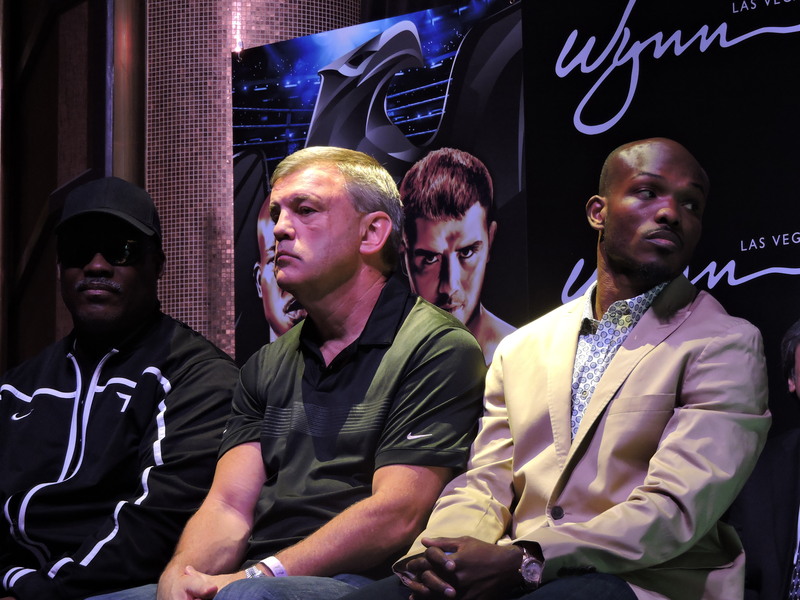 George Foreman said he has been impressed with the career of WBO welterweight champion Timothy Bradley, comparing him to legend Jersey Joe Walcott, and thought he was a boxer who came out of nowhere. But Foreman didn’t realize that he had actually met Bradley early in his career. In 2005, Foreman had flown out to California to do a favor for his 1968 U.S. Olympic teammate, sprinter John Carlos, who was a counselor at Palm Springs High School. During an event, Carlos had asked Foreman to take time out to talk to his friend Ray’s son, who happened to be Bradley. When told of that event, Foreman remembered talking to Carlos’ friend who was a boxer. He just never realized it was Bradley. “That’s who that was?” Foreman said during a telephone interview. “I didn’t realize that was Timothy Bradley at all. Photo courtesy of the International Olympic Committee and U.S. Olympic Committee. It is the friendship between Carlos and Ray Bradley that made the meeting possible for Tim Bradley and memorable for Foreman. Back in 1968, Foreman was just a 19-year-old boxer with a lot of talent but little experience. Carlos was a world record holder in the 200 meters and one of the biggest personalities on the U.S team. He was also a man Foreman looked up to. Once the Olympics began, both athletes were busy preparing for their events and wouldn’t have time to catch up. They made a deal they would meet a few days after the Olympics to share their experiences. “It was the day after the Olympics we were going to meet and go over what happened in our lives,” Foreman said. Carlos won a bronze medal in the 200 while U.S. teammate Tommie Smith won the gold. At the awards stand, Smith and Carlos bowed their heads and raised their gloved fists during the national anthem to protest the lack of civil rights for people of color. Afterwards, Carlos and Smith were ostracized and thrown out of the Olympic Village. Both were booked on the next flight back to America. Days later, Foreman would win his gold medal as a boxing heavyweight. Immediately winning the gold medal, Foreman would pull out a small American flag that he would wave in celebration. For many, Foreman’s celebration was interpreted as a response to Carlos and Smith’s protest. Foreman said that wasn’t the case. Foreman said his flag waving was not a statement to contrast what Carlos and Smith had done. As a 19-year-old, Foreman had fulfilled a dream and he wanted to celebrate and show his patriotism. Because the perception was Foreman was protesting Smith and Carlos, he encountered his own backlash. It became evident when he returned home to Houston. “I’m a happy boy and I’m wearing my gold medal everywhere, the grocery store, everywhere. I didn’t take it off,” Foreman said. “One guy comes to me, and he was a neighbor for years and I knew him. He said, ‘How could you do what you did when the brothers were doing their thing?’ I didn’t understand what he was talking about, I really didn’t understand. The backlash would form Foreman’s surly and intimidating persona when he turned pro. Foreman would ascend to the heavyweight boxing title and forged a legendary career, beating Joe Frazier for the title, losing the title to Muhammad Ali in the Rumble in the Jungle and the Rope a Dope strategy. In his second part of his career, the kinder and gentler Foreman become the oldest heavyweight champion at 47 when he knocked out Michael Moorer in 1994. Outside of the ring, Foreman became one of the country’s most successful businessman with his Foreman Grill. Carlos faced his own backlash. He regularly received death threats and was constantly followed by the FBI. In his book, “The John Carlos Story,” he said the harassment and constant surveillance put a strain on his family life that he separated from his first wife Kim. The lowest point, according to Carlos in his book, was a moment he was so lonely from the isolation that he asked the agent who was following him if he would like to share a cup of coffee one night. By 1989, at the urging of his kids during a detour on a road trip, Carlos had moved to Palm Springs, Calif. What was supposed to be a short stopover became his home for over 20 years. Carlos raised his kids and worked for the Palm Springs Unified School District as an in-school suspension supervisor and a coach. It was through his job he forged a friendship with Ray Bradley, who was a security guard for the district. Ray Bradley said he was 5-years old when Carlos made his protest. When he saw it on ABC’s Wide World of Sports, Ray Bradley said he didn’t understand the protest because he was so young, but developed an appreciation as he got older. It was during those hot, lazy days in the Palm Springs desert when Carlos would share his experience of what happened after Mexico City. “The stories he tells me, I go, ‘I don’t know how you are still here,’” Ray Bradley said. “Everyone wanted to hurt you for making a statement like that. He told me there was death threats, getting banned from the Olympics, kicked him out and sent him home. Carlos’ first wife Kim had committed suicide in 1977. There is a legend of Carlos that still stands today, Ray Bradley said. Carlos had caught two kids ditching. When Carlos found them, they made a run for it, figuring they had several years on this middle-aged teacher and a few blocks head start. The student didn’t realize he was once one of the fastest men on the planet. The kid asked who was the old man who ran him down. Carlos told the kid that if he was in class instead of ditching, he might learn who he was. The kid would find Carlos in a history book. But a young Timothy Bradley knows Carlos as a family friend. He was a friend until Bradley got in trouble one day. Mouthing off in class, Bradley was sent to Carlos by his teacher. Bradley said he was scared. When Bradley walked into Carlos’ classroom, he said what he feared came true. At first, Carlos gave a different version of the incident. Bradley’s father was well aware of Carlos’ reputation. So when Tim returned home and told his dad about what happened, there was no further punishment. Tim Bradley said he didn’t get in trouble again. Carlos said he would see Ray in the weight room, and was mesmerized by how hard he worked. It was as if he was bonding with the weights. And through the years, Carlos said he would see that same kind of commitment from Bradley. “His work ethic is the same today as it was as a kid, because he would get up and run all over the desert. I used to see him out there on the road and I’d just be smiling,” Carlos said. “When I would see him now, I would picture a little boy running in the morning. He never went away from the foundation his parents gave him. So when Carlos was contacted by Foreman in 2005, it was the first time they had spoken since the 1968 Olympics. In Carlos’ mind, he wanted Foreman to meet Tim. Palm Springs High School was planning an event for Black History Month. Carlos asked Foreman if he could show up. Because it was a last-minute request, Foreman chartered a private jet to make sure he could fulfill the request. “He said, he’s coming, He’s coming, so bring your son. I want him to meet him because he’s a great man, a great person. Whatever he can tell him, he could use it. Your son will be big one day. He needs to hear from Big George,” Ray Bradley said. When Foreman arrived, he was busy meeting people all day before his speech. But Carlos made sure the Bradleys were backstage, so when Foreman was through talking, they could meet. While the day was a whirlwind for Foreman, he said meeting the Bradleys stuck out because Carlos made them a priority. And then what Foreman saw also stuck with him, and that was Tim with Ray and his mom Kathleen. “You meet a lot of boxers, and they come up with their trainer or manager or promoter. Very rarely do they come with their family,” Foreman said. “It makes them different, that they have people who love and care for him. One thing that has already come out of the newly minted Timothy Bradley and Teddy Atlas partnership has been an array of colorful metaphors. Bradley, the WBO welterweight champion, hired Atlas to help with his defense so he will not take as many devastating blows like he has in recent fights. Bradley has promised he will be a “smart monster,” where he will be more cautious without losing his aggression. Atlas, the longtime trainer who has been solely a successful broadcaster that last few years, said one of the main goals will be to eliminate “mortal sins,” or the mistakes that has resulted in Bradley getting hit with big shots. Being a smart monster and avoiding mortal sins will be crucial tonight when Bradley defends his title against Brandon Rios, an aggressive fighter who Atlas says begins coming forward during the national anthem. Throughout the years, Bradley has established himself as one of the sports best fighters, demonstrating a tough chin, relentless determination and athleticisms that fuels his versatility. But he’s been proving he has a tough chin too often for his own comfort. In 2013, Bradley sustained a concussion in the first round and was knocked down again in the 12th round before scoring a unanimous decision over Ruslan Provodnikov. In December, 2014, Bradley’s face was mutilated in a draw against Diego Chaves. In Bradley’s last fight, he got caught with a big right that wobbled him in the final minute against Jessie Vargas before scoring another unanimous decision. But working with Bradley will be more tinkering, not an overhaul. Bradley returns to the Thomas and Mack, where he had his signature victory over Juan Manuel Marquez in 2013. Marquez was fresh off his devastating knockout of Manny Pacquiao at the end of 2012 that left the Filipino superstar out cold and face down on the canvas for nearly two minutes. Bradley controlled the fight, avoided danger and won a convincing majority decision. But even before the Marquez fight, Bradley had been an elusive boxer. Against future world champions Devon Alexander and Lamont Peterson, Bradley outclassed each. In the first of two fights against Manny Pacquiao, Bradley was able to avoid big danger against one of the sports biggest punchers. 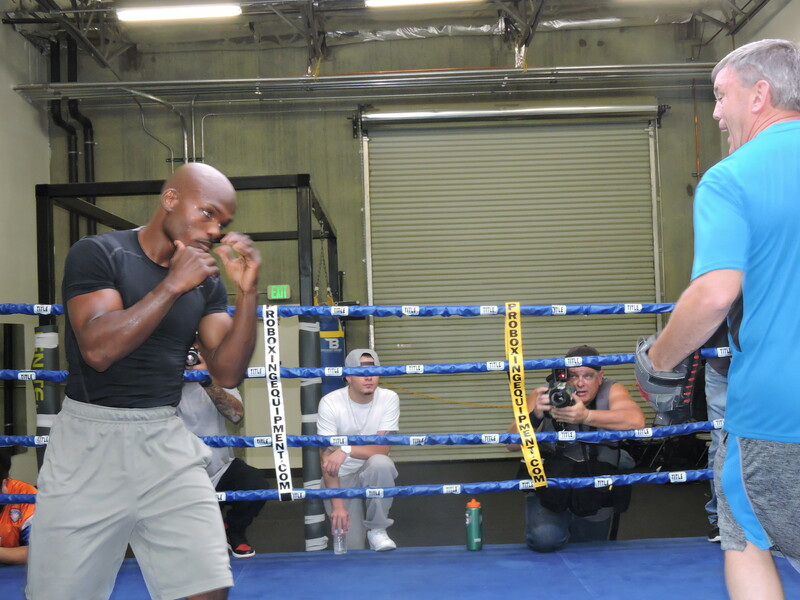 Since the Provodnikov fight, Bradley has engaged more and gotten hurt more. The aggressive style has Rios believing that Bradley will re-engage in his brawling style when he either gets hit or challenged. We’ll find out Nov. 7. 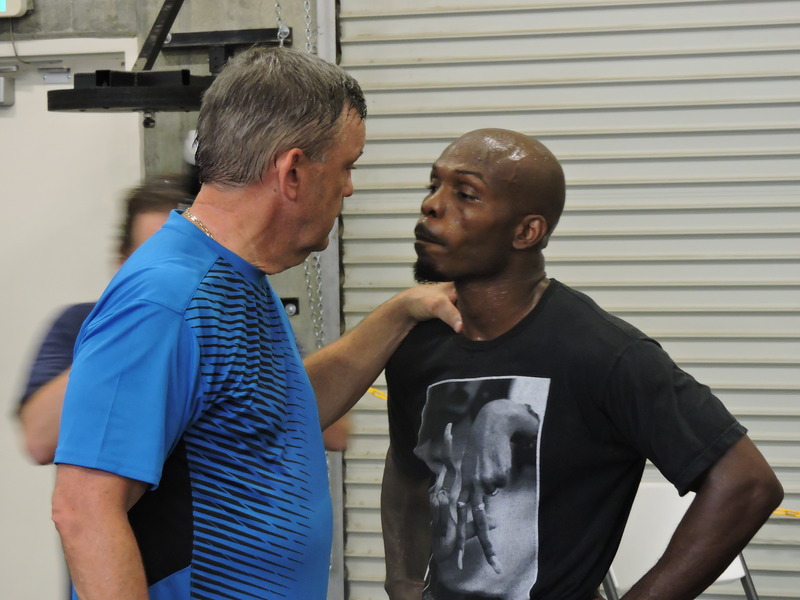 One person who was crucial in getting Teddy Atlas to return to boxing to train WBO welterweight champion Timothy Bradley had never met the Desert Storm until this week. When Bradley approached Atlas, he initially said he wasn’t interested in training again. That was until Atlas spoke to his daughter Nicole, who has a knack for convincing people as a successful lawyer. In convincing her father to return, Nicole had never met Bradley or his team in person until she arrived in Las Vegas with her mother and brother. Bradley will defend his WBO belt against the rough and rugged Brandon Rios on Saturday, Nov. 7 at the Thomas & Mack. HBO will telecast the fight card starting at 6:30 p.m., PST. Throughout the seven-week training camp, Atlas has constantly been keeping Nicole and the family posted. And Nicole said the affect has been positive on her dad. Atlas was co-hosting his radio show on Sirius XM when he had Bradley as a guest. It was days after Bradley had regained the vacant WBO welterweight title after beating Jessie Vargas. Despite dominating the fight, Bradley was caught with a big right in the final minute that left him wobbly. Bradley was a phone-in guest for “Going the Distance,” which Atlas hosts with Wally Matthews and Nabate Isles. Bradley didn’t have an answer for why he got hit, so Atlas began to break it down. His co-hosts just went silent and listened to the interaction. But Atlas didn’t think it was anything more than an interview. His co-host had different thoughts. It wasn’t long after when Bradley did call Atlas, but he wasn’t interested initially. During that time, Bradley decided to part ways with Joel Diaz, who had trained him his entire professional career. But it was talking to Nicole that changed his mind. Another thing that convinced Atlas to return to training was getting to know Bradley. Atlas liked Bradley’s character and was comfortable with his family. Nicole said she’s even noticed a change. 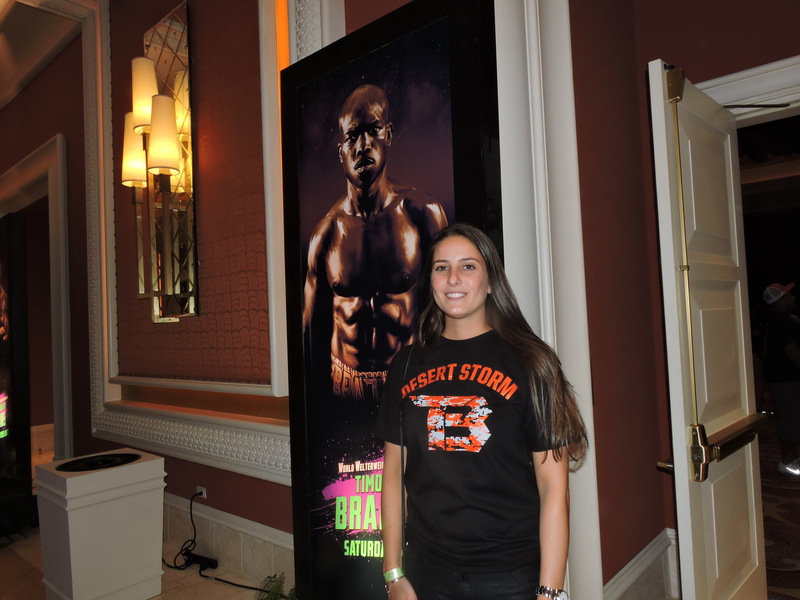 During the weigh in, Nicole was with her mother Elaine and brother Teddy III were sitting in the back row and passing out “Desert Storm” black t-shirts to their other family and friends who joined them from the East Coast. “It’s exciting. Definitely, we’re excited, but at the same time, nervous,” Nicole said. “It’s been a few years since we’ve had to worry and care who wins the fight. Normally, we watch all the fights. It doesn’t matter who wins or lose. We just watch it for the entertainment. It’s exciting. 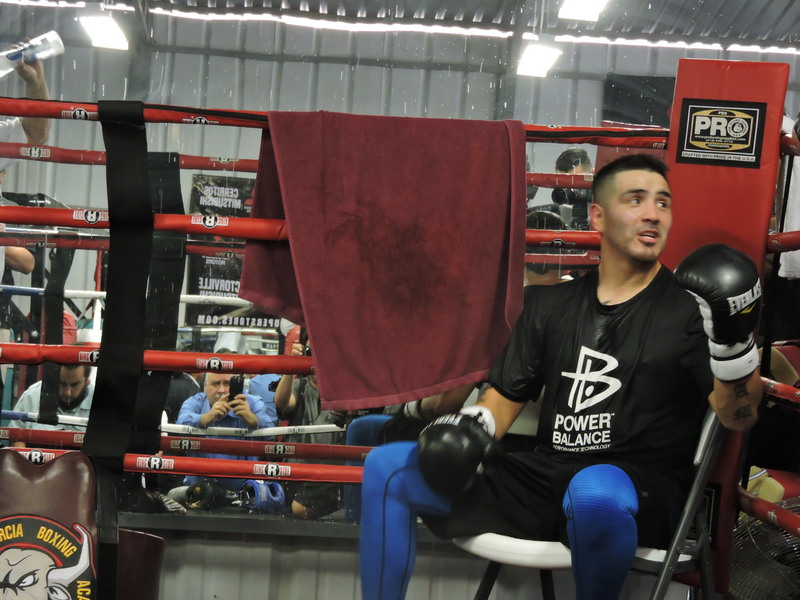 Brandon Rios answers questions following his media workout on Oct. 27 in Riverside, Calif. Rios is preparing to take on Timothy Bradley on Nov. 7 at the Thomas and Mack in Las Vegas. 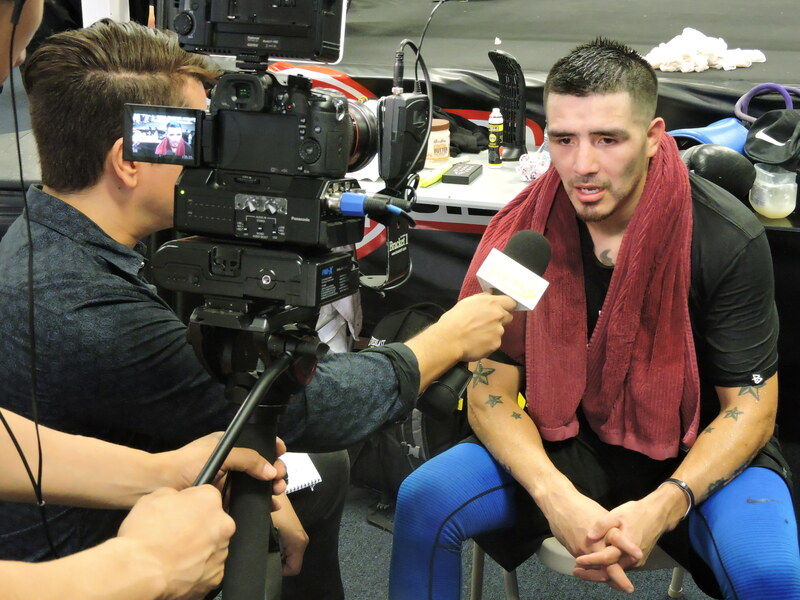 In January, Brandon Rios punctuated the final chapter of his trilogy against Mike Alvarado with a third-round knockout. But following the fight, something unexpected happen for Rios. A popular fighter for his action style, no one wanted to fight Rios. As months passed by, Rios got irritated. It was after the first fight against Alvarado when Rios’ career his a rough patch. Rios lost the rematch against Alvarado, and then was dominated in the biggest fight of his career, losing a unanimous decision to Manny Pacquiao.